- Half the paper consumed in America during the year are used to wrap and decorate gifts! Over Christmas, we throw out an additional 1 million tonnes of paper waste per week! eek! -If every family re-used just 2 feet of ribbon, the 38,000 miles of ribbon saved could tie a bow around the entire planet! 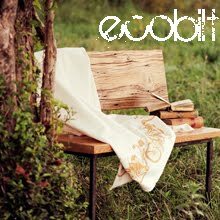 So, with this in mind, here are a few easy, less expensive, more creative and equally attractive ideas! 1. This is a classic, and surely there is one savy penny pincher in the family that does this already. The trick is to use interesting pages, ones with nice typeface, a crossword, comic and so on. The next crucial thing to ensure they look pretty under the tree is to accessorize. 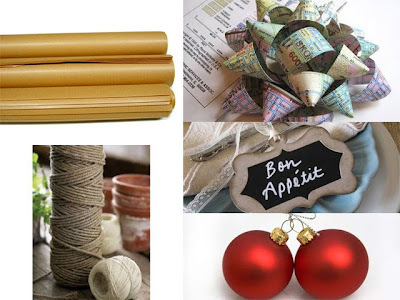 Use recycled ribbon, twine, leftover Christmas ornaments or a handcrafted gift tag to make it nice. Or, slip a twig or pine sprig under the ribbon for a festive touch! 2. 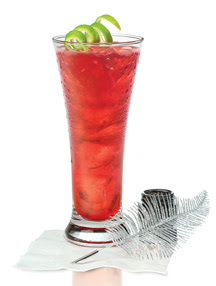 From Scoutie Girl comes this idea. 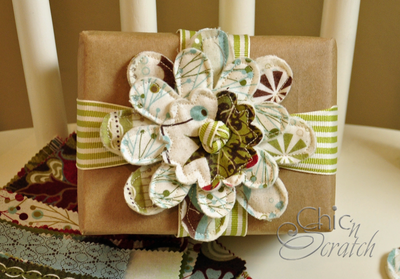 A pretty, handcrafted gift tag is slipped under some coordinating baker's twine to dress up this unassuming paper bag. Really! (Just make sure the bag is made with recycled content.) To me this conjures up images of packages and parcels from yesteryear. I'm liking it. 3. 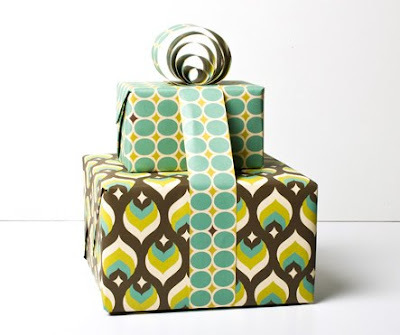 If you just can't forgo the thought of wrapping paper, make a sustainable choice and pick the recycled kind, with water-based inks. Just a note: this is not for the budget shopper, these babies can cost as much as $4.00 a sheet! These retro mod papers are by WhimsyPress. 4. 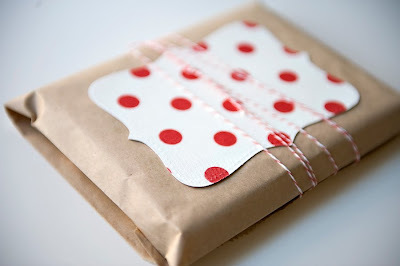 Another idea for dressing up the brown paper package is using scrap fabrics or felt. Cut out a petal (fold the fabric in half and cut a scalloped edge) in three sizes. Cut a hole in the center, loop a longish peice of ribbon and feed though the hole; tie a knot and use the rest to tie around the gift. I bought some felt made from recycled pop bottles that I want to try this with, which would save having to stitch the raw edge of the fabric. 5. 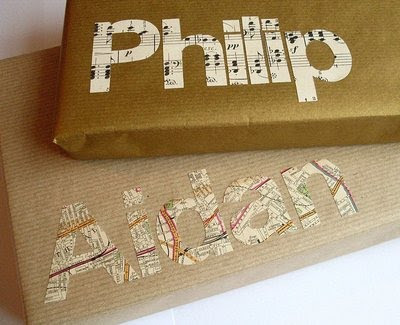 Another idea using scavenged or recycled materials for personalizing and dressing up the quintessential brown paper package. From threadbanger. Finally, from my own personal arsenal of wrapping supplies. -A homemade bow (this is my husband's contribution, he's been doing this for years). Click here for instructions. -A homemade gift tag - this year I'm thinking of slicing birch branches into thin 'coins' and using a wood burner to personalize. I like the chalkboard paint idea pictured above though, this ensures they will get reused year after year. -Finally, I like a little adornment. Red balls are my favourite (for contrast), but you could use anything! Merry Christmas & Get Wrapping! This is Celine's husband speaking. 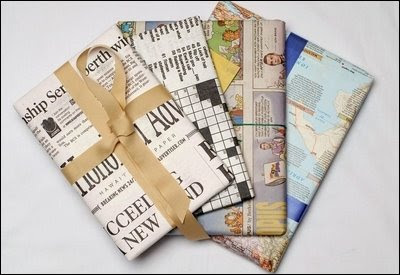 I have been using brown recycled wrapping paper and newspaper, well, since I found out duct tape wasn't eco! Ribbon, like duct tape, is largely landfill fodder so here's another idea: take a long strip of paper and fold it lengthwise in three so that the cut edge is in the centre of one side. Voila - ribbon! Make two little loops of your new ribbon and cross them with a small square in the middle and Voila - a bow! It's Easy Guys, and your wife will be so impressed she won't care that you got her a make your own beer kit! I'll get Celine to post a picture.